10:21-12:47 Anyone, teachers or students grades 9-11, who has not had pictures done may come to the LIBRARY for pictures. Students will NOT be called out for pictures. Teachers, please release them at the appropriate times. 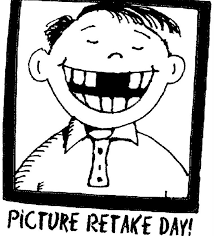 Students who wish to purchase retake pictures should come by room 124 for retake envelopes. If students are retaking photos and had purchased a package, they must return the unopened package to the photographer. It is free to be in the yearbook, so please send students who say they missed picture day. Students who take pictures will come back to class with a pass/note.